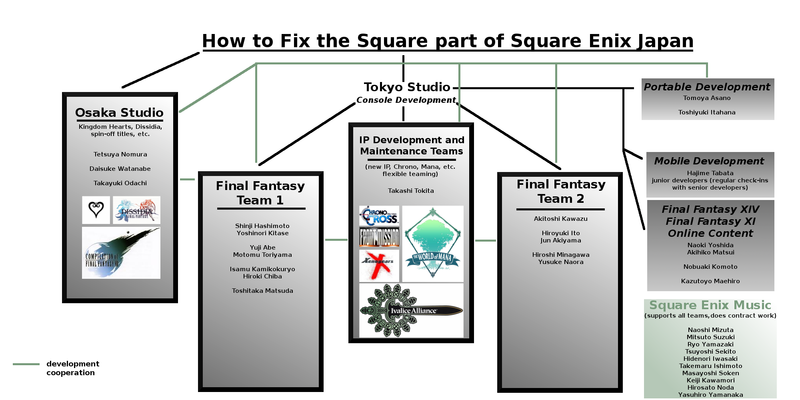 In this thread, I fix Square Enix. This is the result of a totally unserious but amusing afternoon. Please don't get too worked up about it. Also, please be excited. 2. No matter how much we wish otherwise, Motomu Toriyama will remain at Square (unless he willingly goes off on his own). 3. As much as we might dislike anything related to FFXIII, it was smart business-wise to produce sequels. The first of two FF teams, largely staffed by PDD1 members. Hashimoto & Kitase, Producers; Abe & Toriyama, Directors/Game Designers; Chiba, scenario; Kamikokuryo & Matusa, art. The second FF team, containing a mixture of PPD2 and former PDD4 members. Kawazu, Producer; Ito & Akiyama, Directors/Game Designers; Minagawa & Naora, art. Takashi Tokita is moved from portable to this division, where he heads the development of new IP along with maintaining (or possibly resurrecting) old ones. Tetsuya Nomura is relocated and put in charge of the Osaka branch, set to focus on Kingdom Hearts, Dissidia, and other spin-off titles. Watanabe joins him as scenario writer along with Odachi as art director. This studio may collaborate with FFTeam 1 on occasion. Focuses on handhelds. Asano, producer; Itahana, art. Cooperates with other teams. Continues to develop the Bravely Default franchise. Headed by Hajime Tabata, focuses on mobile devices. The best of young talent goes here to work under the supervision of senior staff from all teams, while enjoying the greater responsibility necessitated by a smaller dev team. These individuals are grown to be future lead team members in other teams. They practice both as creators and supervisors, frequently working with outsourced studios. This is a combination of MMORPG and social game teams. 2. The FF teams work in parallel but on different mainline titles. To be as financially viable as possible, each title is designed from the beginning to be multi-part. Of course, in theory we would hope for content that is supported by mutliple entries, rather than content that is stretched out for the sake of profit. The main principle here is to optimize world/mythos depth, character development, and the re-use of art assets to recover development costs. 3. Disband the in-house CG studio (formerly the major producers of things like Spirits Within and Advent Children). CG movies are removed from the development process. The artists are split between other teams. 4. All artists and programmers are split between teams, with the highest concentration going to Final Fantasy, Other IP, and Osaka. Flexible teaming where needed. 6. Square's music department is the last remnant (har har) of the old way in which Square worked--that is, teams were formed very freely and by collective request. It functions very well despite losing most of its most well-known composers. The music team supports all other development teams by request, and also continues to do contract work. 1. Reduced development costs overall. 2. Shorter wait time between main FF titles. 3. Return to wide variety of IP releases, such as from 1995-2001. 4. Greater profit from reduced dev. costs combined with more frequent releases. 5. Growing young talent via cooperation with senior developers. just as a note a xenogears will never be made with squaresoft ever again since nintendo bought out monolith soft. otherwise I enjoyed the graphic.